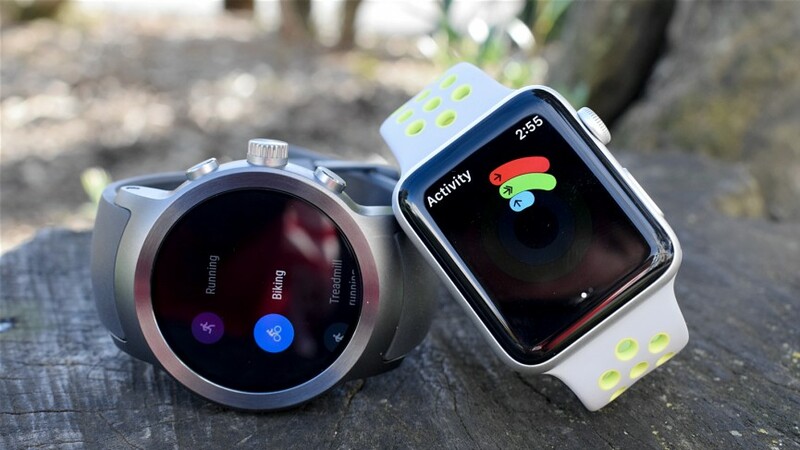 With Wear OS having now replaced what was formerly known as Android Wear and the Apple Watch now sporting the fourth iteration of its software, the battle for smartwatch supremacy is closer than ever. Like the smartphone war that still wages, the differences go beyond just price and looks – it’s ideological. 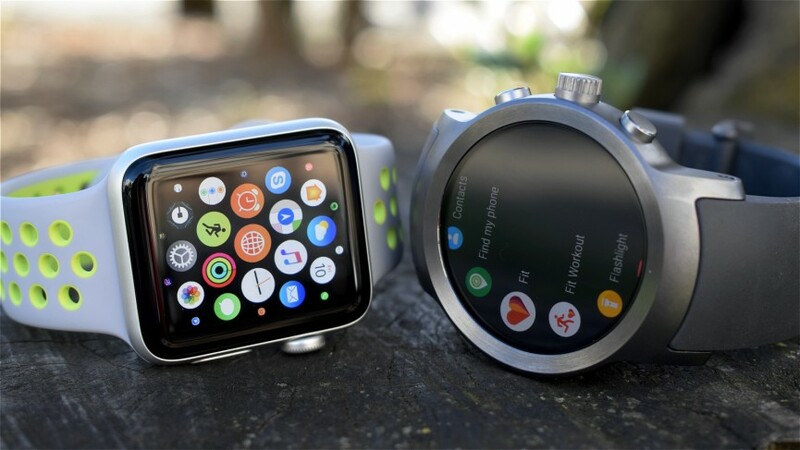 Apple’s singular experience versus the choice and variety offered by Wear OS; Apple’s huge fanbase and army of devoted developers and accessory makers against Google’s mighty partners and powerful platform. As with smartphones, Google provides its software to a whole host of hardware partners, whereas Apple takes care of the hardware design as well as the on-board OS. That means comparing Apple Watch with Wear OS involves grouping together a whole host of devices on the Google side. Then there’s compatibility. The Apple Watch only works with the iPhone whereas Wear OS pairs with both Android and iPhone – and gives iOS users an even better experience in Wear OS. Psst, Google changed the name from Android Wear to Wear OS because of its ability to straddle both ecosystems. Having spent time in both camps, we’re pulling together a comprehensive comparison of the two so you can decide which – Apple Watch or Wear OS – is the one for you. 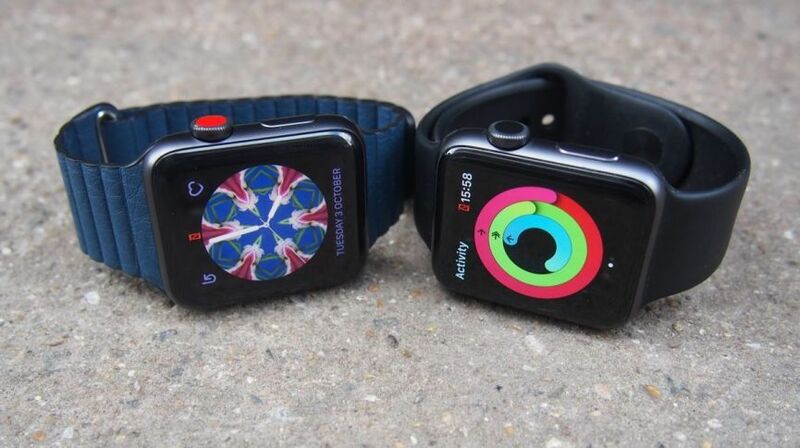 Apple Watch continues to aim for the luxury market, but with both Series 2 and 3, Apple has steered its wearables ship a few more degrees towards fitness. There’s a choice of five models across two sizes – 38mm and 42mm – and with dozens of straps, meaning how high-end you go just depends on your budget. You have the aluminium Watch Sport, with and without cellular; the stainless steel Watch; the aluminium Apple Watch Nike+; and the ceramic white and gray Edition, which replaces the 18k gold model. You also have Apple Watch Series 1, which is a refreshed model of the original that gives it a few internal enhancements, save for GPS and LTE – but it’s only available in aluminium. The basic design is constant through all the models, and all of them are compatible with any Apple Watch strap, of which there are many. 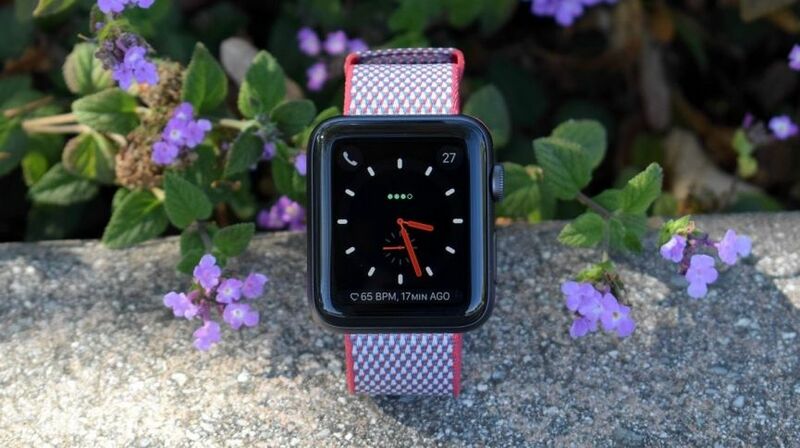 Classic link bracelet, rubber sport band, casual woven nylon, the velcro-like sport loop, leather loop, classic buckle, modern buckle, Milanese loop – the decision is yours. Third-party strap makers including designer names such as Hermès have added their designs into the mix. And don’t forget Nike, which offers its perforated (and breathable) sports bands. The digital crown on the side of the device is a nice touch too, allowing you to scroll and zoom without having to obscure the screen. Perhaps the only criticism you can give the design is that it’s square, but that may not be a problem for some people. As we’ve said, there are many different devices to consider on the Wear OS side. While the first Wear watches were rather chunky and unappealing, the fashion world has come into the Wear OS world with a gusto. 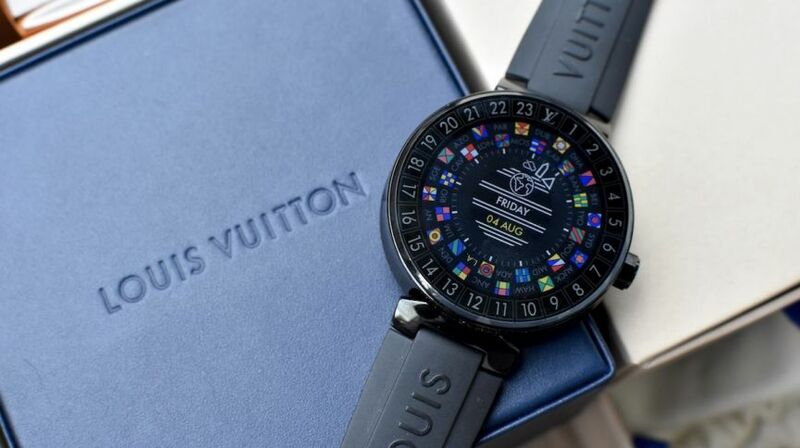 Watches like the Louis Vuitton Tambour Horizon, Michael Kors Access and Tag Heuer Connected Modular 45 show off how beautiful Wear OS can be. At the same time, there are fashion-forward options from the tech crowd, like the Huawei Watch 2 and Asus ZenWatch 3. Then there’s the LG Watch Sport and LG Watch Style, which are still some of the best overall Wear OS smartwatches out there – though the former is a little chunky. If you look hard enough, you also get to decide if you want a rectangular or circular face, a choice not even possible with the Apple Watch. Admittedly, this choice is getting harder to make as most Wear OS watches nowadays have round faces. Google’s software runs perfectly well on both screen shapes, but there is still the occasional bit of cut-off text on the circular versions. And while, again, configuration options depend on what you’ve gone for, Wear OS devices typically offer more support for replacement straps than the Apple Watch does. In fact, many will fit any watch band of a certain width. Both the Apple Watch and Wear OS devices give you the option to pick a wearable design that works for you, but it’s the Google-powered watches that offer most in the way of customization and overall appearance options. With options like the Polar M600, Fossil Q x Cory Richards and Movado Connect, there really is a Wear OS watch for everyone. Wear OS screens come in various shapes and sizes, even from inside the same company. Designers have learned that not everyone has massive wrists, but at the same time they’re trying to cram more tech inside – so sometimes it feels like we’re still breaking even in the size department. The Diesel On Full Guard sits near the top end of the chunkier end of the scale, and you’ve got options like the Huawei Watch 2 and the Michael Kors Access Sophie offering more reasonable dimensions. 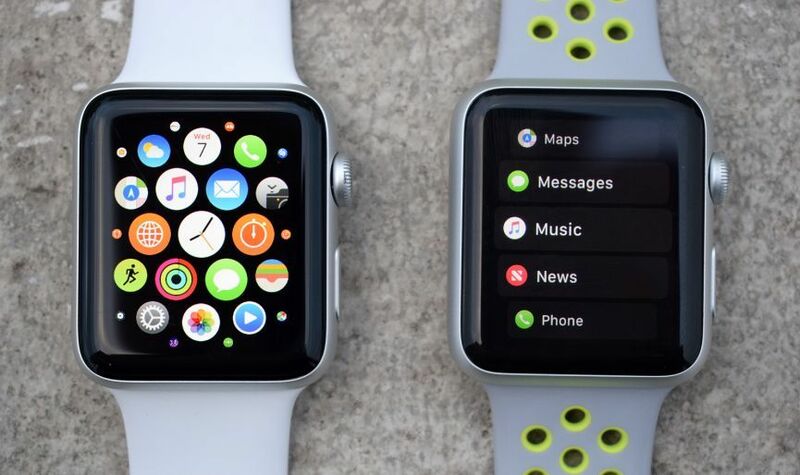 As for the Apple Watch, there are two screen sizes to pick from: a 38 mm tall model with a 1.5-inch screen and a 42 mm variant with a 1.65-inch screen. The dimensions of 272 x 340 pixels (38 mm model) and 312 by 390 pixels (42 mm model) are enough to earn the ‘Retina’ badge Apple applies to some of the other products in its line-up, but take note that the Series 3 has enhanced brightness of up to 1,000 nits, while Series 1 gives you 450. The Apple Watch screen is absolutely as impressive as you would expect from a company that makes the iPhone, with sharp and bright colors and a special force touch interaction to bring up context-sensitive menus. Even the Series 1, with its lower nit count, is still pleasantly vibrant. 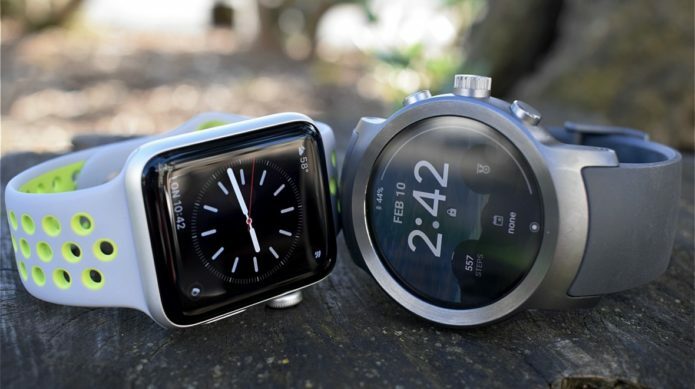 Battery is the Achilles’ heel of most smartwatches, and Apple’s device is no different. We can stretch the Series 3 watch to two days, while the Series 1 is closer to a single day. And if you’re using the GPS or LTE, expect to reduce that dramatically – especially LTE, which will give you only an hour of continuous call time. Either way, you’re probably going to find yourself charging it each night. As for Wear OS, there’s not a lot more to shout about, as most of the crop sit somewhere between one and two days. So, it’s a similar story. Whether you’re opting for Apple or Google, don’t expect more than two days of battery right now. If you’ve used both iOS and Android on smartphones and tablets then you already have a pretty good feel for the Apple Watch and Wear OS aesthetics, although their wearable versions are somewhat different in terms of layout. The Apple Watch takes a very clean, uncluttered approach, and you can choose from either a honeycomb apps grid or vertical apps carousel that, honestly, you probably won’t dive into when you have instant-loading apps from the dock in watchOS 4. The two physical buttons on the side certainly help when it comes to navigation — tapping on the digital crown, for example, takes you home, and lets you zoom in and out. The other button is a shortcut to the aforementioned dock. There are a lot of watch faces to choose from, but unlike Wear OS you’re stuck with the options Jony Ive has selected. At least there are plenty of ways to customize them via complications, which are the small info nuggets that apps can deliver to the face, be it a weather forecast or an event reminder. Apple is consistently expanding the number of faces you have too, with the most recent being the Toy Story faces, a Siri face and a kaleidoscope face in watchOS 4. If you have the Series 3 with cellular, you also get the cellular face that tells you if you’re connected to your network. The Siri face is especially useful, providing a continually updating timeline of your calendar and other events it feels are relevant throughout the day. Wear OS, on the other hand, is completely open to third-party faces, but the options make for a mixed bag. A lot of manufacturers, especially the Fossil Group, have been trying new and interesting things with watch faces. The Diesel On Full Guard, for example, adds in a HUD that gives you quick access to info, while some of the other style brands have used faces as a way to stamp their signature look on Wear OS. Thanks to Wear 2.0, designers can now include complications in their designs, making them more useful. These work similarly to the Apple Watch, although you can have more of them on the screen at once with Wear OS. The pop-up cards have also gotten smarter. They’re now less intrusive and don’t constantly take up half the screen. This means less swiping and tapping – and an OS overall feels much more intuitive with the update. What’s more, Wear OS 2.0 adds support for rotational input, and the first LG Watches running Google’s new software have Apple Watch-like crowns that let you scroll and zoom. 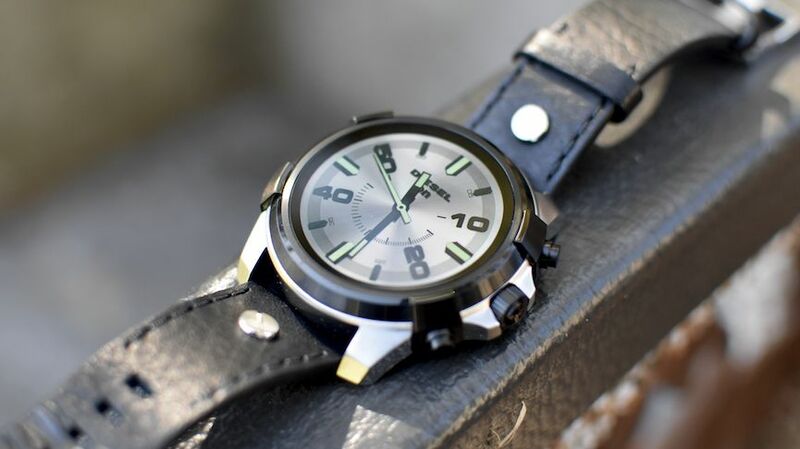 This feature has been gaining a lot of steam recently, with the new fleet of Fossil watches all adopting it. Google also brought support for its Assistant to Wear OS 2.0, which is a more advanced version of Google Now. It’s smarter and more contextual, making you feel a little less like you’re talking to a robot, but it’s still not perfect and you may well find yourself skipping this feature. Both Apple’s and Google’s platforms make extensive use of voice control in lieu of a touchscreen keyboard, providing a convenient – if not 100% accurate – way of responding to notifications and performing actions on the wearables if you’d prefer. Assistant is smarter than Siri right now, but when it comes to recognizing words to reply to messages, both have come a long way. Siri got a little boost with Series 3, as she can now talk to you. Fair warning, this works best when paired with earphones. If you’re thinking of going Google on an older smartwatch, make sure you check here first to make sure it will be getting the Wear OS 2.0 update. If it isn’t going to, we’d advise against it. Apple has been eager to underline the health and fitness capabilities of its smartwatch at every available opportunity, and its Activity Rings have become a bit of a platform of their own. As well as the Series 3’s on-board sensors, measuring GPS, heart rate, steps, elevation, sleep (with third-party apps) and more, it ties in with the Health app on an attached iPhone. As features such as Medical ID and ResearchKit show, Apple is serious about health, and with the addition of GPS and waterproofing – for runners and swimmers – the Series 3 is heavily pitched as a fitness device. And beyond Apple’s own tracking, you have the option to load up third-party Apple Watch running apps like Strava and Runkeeper. Just note that the Series 1 lacks both of these features, so its tracking powers are a little more limited. There’s also GymKit, which will let the Watch sync data with select gym equipment. VO2 Max is another new addition to the fitness equation, but it’s a bit hidden. You have to do a rigorous 20 minute walk or run in the Workout app to see the results, and you can only see those results in the Health app on your phone. Over on the Wear OS side of the fence, most smartwatches give you step and sleep tracking, but heart rate and Android Pay are a little harder to come by. Some of the more luxury watches, like those from the Fossil Group, don’t feature a HR tracker. They also seem to make up the bulk of the Wear OS releases nowadays, so be warned, and check too for that NFC for Android Pay. 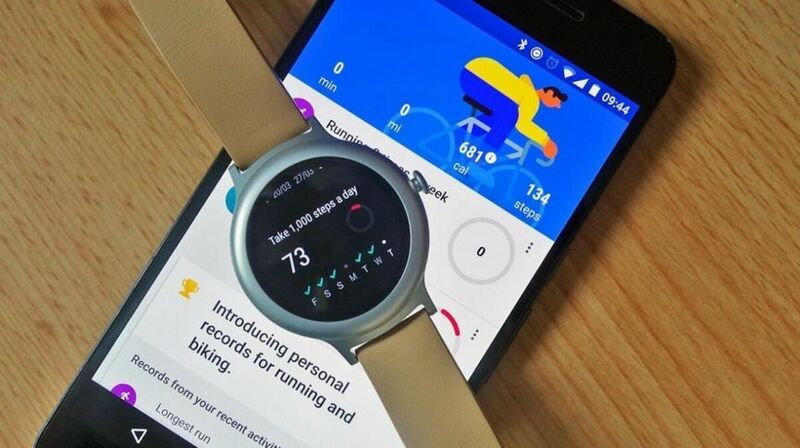 Google Fit comes as standard in Wear OS, and the Fit platform has got better with support for a wide range of gym workouts on top of the usual running and biking. If you have a GPS-packing smartwatch like the Polar M600you’ll be better able to take advantage of this, not to mention, again, all the third-party options which become more useful in Wear 2.0. Standalone apps mean you can do a lot more without having your phone nearby. Apple and Google are quite similar when it comes to what you can track on their platforms, but with Wear OS it’s going to come down to what the hardware itself is capable of. Thanks to the prestige that Apple brings with it, people have been building Watch apps to do everything from unlocking your car to tracking your next flight or calling a cab. With more than 10,000 apps for Apple Watch available, you will find a mixture of well-know brands and some interesting indie projects too. On both watchOS and Wear OS (post-2.0 update) developers can now build standalone apps for these devices, meaning you need to spend less time with your smartphone diligently tethered. On Apple Watch, this could accelerate given the Series 3’s powerful new processor and its LTE-enabled untethered abilities. One of the clever features of Wear OS is the way it supports notifications from any app right out of the box, even if the app in question hasn’t been updated for a long time. Developers can choose to build on top of this basic functionality to provide more interactive elements or even an app that runs solely on the smartwatch itself. We still want more ‘killer apps’ on both platforms, but with Wear OS 2.0 we’re seeing a flood of new ones that make Google’s smartwatches stronger. If there are certain apps you think will be your go-tos, it’s worth checking which platforms support them (and how they vary between) before paying out for a flashy new smartwatch. While Apple was once positioned more towards the high-end market, the release of more premium Wear OS devices and more of a push from Apple on its formerly-named Sport models has seen the two coalesce on the price scale. There are still plenty of expensive options in both camps though. For example, Apple’s Ceramic Edition Watch comes in at an eye-watering-but-less-ridiculous-than-the-gold $1299 for the 42mm. Meanwhile the aluminum Series 3 starts at $329 without cellular and moves up to at least $599 if you want it in stainless steel. Of course, if you want to plump for a different/better band, you’re going to be paying more – especially with premium designs like the Milanese loop on offer. The benefit of partnering with many manufacturers means Wear OS has more appealing options to the budget-conscious, and while some of the best bargains right now can be found in older models, even some of the newer ones come in under Apple’s pricing. 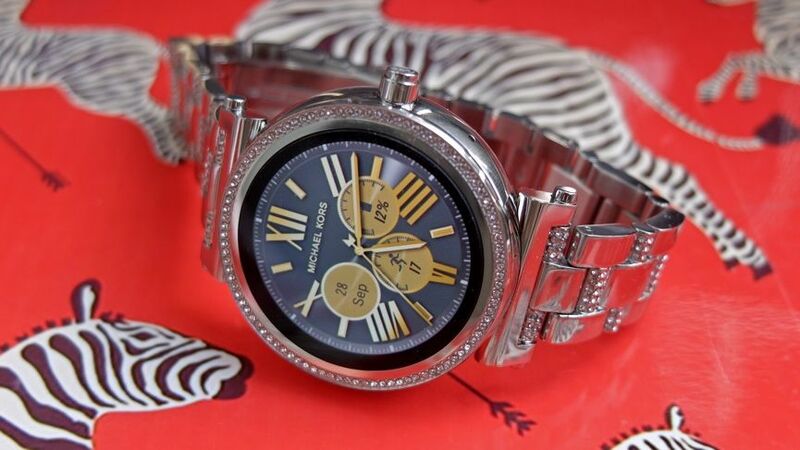 A stainless steel Michael Kors Access Grayson will cost you $349, while you can get a ZenWatch 3 for $212 and a feature-packed Nixon The Mission for $400 The Tag is the most expensive, of course, starting at $1,650. On the other hand, you can now pick up a Moto 360 Sport for less than $150. Price is one of the areas where Wear OS has more to offer, but by offering Series 1 alongside its newer models, Apple has found a way to offer something more affordable that doesn’t feel too behind the times. Any good operating system needs updates to patch problems, enhance features and keep everything fresh and tidy visually. That’s no different with Apple Watch and Wear OS. Apple, as we know, works like clockwork in regards to software updates, but it also does a good job of mostly keeping older devices in the loop. That hasn’t been entirely the same with Wear OS, as different devices received Android Wear 2.0 at different times. That may be changing now though, as Google tells Wareable the company will not be having big, yearly upgrade packages. Instead, it’ll just roll out new features as they’re ready to deploy. For the next series of software updates, Wear OS is set to change quite a bit (other than new branding). Google has confirmed that it’s looking to beef up its health features, with a specific focus on “proactively coaching and motivating users to stay more active”. It’s also looking to create a smarter assistant, better connectivity with iPhone, notifications that are better suited to a wrist than a phone, and more. As for Apple, while we don’t know too much about what watchOS 5 could hold, we do know that it’s likely to debut StreamKit, which would allow third party apps like Spotify to tap into the cellular ability of the Series 3. As we mentioned earlier, choosing your smartwatch is going to be largely influenced by what kind of smartphone you’re currently rocking. Less so now that Wear OS works with iPhones but remember that you can’t get an Apple Watch unless you use iOS. Moreover, if you’re using Wear OS with an iPhone, you’re still not going to get the full experience. With Apple, the software and hardware have been tightly woven together, and with watchOS 4 it all feels more intuitive. Plus, Apple has services like Apple Pay and features like LTE ready to go for most people, while it’s much harder to find an Wear OS watch that sports both of those features. Wear OSsmartwatches have caught up in the hardware department thanks to better design, with companies like Tag, Fossil and Louis Vuitton all getting involved. We also think it’s finally snapping at Apple’s heels in the software section, with Wear OS 2.0 offering a significant leap forward from what it was. Plus, you have the benefit of cheaper options. There was no easy answer when we first put the Apple Watch and Wear OS side by side, and truth be told, that’s still the case. Just keep in mind everything mentioned above and think it over carefully before making your decision.